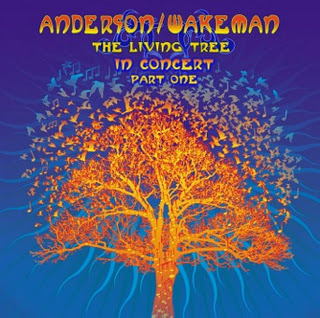 It’s not the easiest thing to re-imagine the complex music of Yes in stripped-down arrangements for guitar, voice and keyboards, but that’s exactly what former Yes lead vocalist Jon Anderson and keyboardist Rick Wakeman did for this live album, which documents a series of performances the pair gave in support of their duo album The Living Tree. The album’s track listing consists of familiar Yes classics interspersed with deep cuts from the Yes catalog, as well as songs from Anderson and Wakeman’s duo album and solo work. It’s not much of a musical stretch for songs like “The Living Tree (Part 1)” or “23/24/11” to come off in this setting, since they were essentially tailor-written for this approach, and the pair delivers strong versions of those songs. But it is the Yes material that is the most challenging, and produces the most surprising results both pro and con. “And You and I” is perhaps the best of that lot; it turns out that a piece of material that was fairly densely orchestrated as recorded has a strong enough chord progression and melody to stand up in a sparser arrangement. You wouldn’t mistake it for Yes . . . take away the drums, bass and guitars from the Yes recording, and that’s essentially what you have here. But it works surprisingly well, as does “South Side of the Sky,” a fan favorite from Fragile that also receives the stripped-down treatment. Anderson has performed “Long Distance Runaround” acoustically many times, so it’s not as much of a surprise that it works, but the duo’s quasi-reggae version of “Time and a Word” doesn’t serve the song as well as a straighter folk rendering probably would have. It’s debatable whether this is actually progressive rock, per se; in the absence of most of the rhythmic arrangement elements, much of this material comes off more like progressive adult contemporary. But the dreamy atmosphere Anderson and Wakeman create proves a suitable showcase for the elements they brought to the music of Yes, and Anderson still possesses one of the most undeniably distinctive voices in rock music, even if he sings some of these songs in lower keys than the original recordings. One very welcome addition is the closing song, “The Meeting,” a gorgeous performance of a mostly-overlooked song from the Anderson, Bruford, Wakeman and Howe project. If you’re looking for Yes, you won’t find it here. But if you’re open to interesting new interpretations of the music of Yes, there’s still plenty to like about The Living Tree In Concert Part One. This entry was posted on Thursday, January 12th, 2012 at 00:00	and posted in Jon Anderson, Review, Rick Wakeman. You can follow any responses to this entry through the RSS 2.0 feed.